As far as I am concerned, Four Blue Cannons CL is the ultimate American Quarter Horse. He is the animal I had in mind when I set out to breed a horse that was perfect in every way. It took me about 10 years to get him, but believe it or not, I knew this would be the result before I ever laid eyes on him. God gets all of the credit for creating this fine animal; although I selected his sire and dam for breeding purposes. 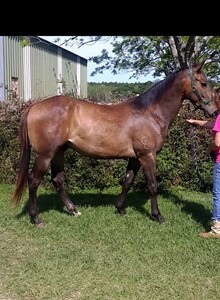 As I have stated many times, there are only a few true Blue Roan Horses in the Quarter Horse Registry, but I do not know of any others that will compare in build to Cannon. 05/14/2009 Cannon has now had 60 days of training and he is doing fantastic! Steve Stephens has started him on some cattle in the cutting pen . We are bringing him along slowly because he is so young . He appears to have everything it takes to become a first rate stock horse . When he is working a cow , he has his full attention on what he is doing . I sure am proud of this Blue Roan Quarter Horse and the potential he has in him . The big picture shown above is of Cannon and Claude in May of 2009. Four Blue Cannons CL or "Cannon" as we call him is the ultimate example of our breeding program . 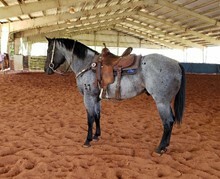 He has an almost perfect build and is a beautiful blue roan quarter horse to boot . These qualities along with his excellent disposition make him an individual of which to be extremely proud . His hip is something to behold! His seventh birthday will on April 22 , 2014. 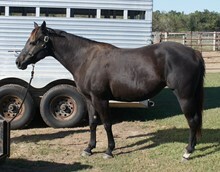 His dam is the first Figure Four Fritz daughter that we purchased back in 1999 . Her name is Four 976 or Miss Four as we call her . 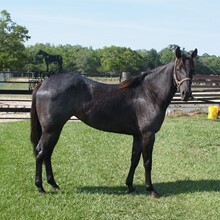 You can see some pictures of her on our Broodmares page . She is one fine mare ! 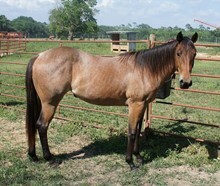 Cannon's sire is GB Cee Booger Red CL ; the stud we sold in February of 08 in San Antonio , Texas , at the Seagraves sale . We understood that he was purchased by someone in Mexico . Cannon is now our main stallion. 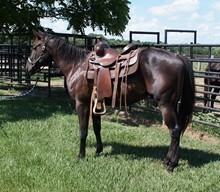 He has produced five colt crops for us since his first baby was born in February of 2012. Suzanna Hill started training Cannon on barrels in 2016 and he has really done well. We bred a few mares to him in the spring of 16 and he has gone back to his barrel training. He will be competing more and more in the near future. Since Suzanna decided to hit the Pro Rodeo Circuit full time in 2017 running Bo, we have Cannon back at home for the new breeding season. We plan to breed a minimal number of our mares to him and will take a few outside mares this year. His stud fee is $1,000.00. If a mare stays here, we will also charge mare care. I can only keep a couple of outside mares here at one time.